I recieved the following mail from Sai Baba devotee from Germany -Frankfurt providing with the new Shirdi Sai Baba Temple in Frankfurt and website they have created.This is to update and inform all the Sai devotees to visit the temple who are living in Germany or wish to visit the temple.How Sai Baba came in life of Hari and Few pictures of Shirdi Sai Baba are placed here for the devotees to have Baba's darshan . Thanks Hari and Marcus for updating me and providing important information to share with all .Here is the mail attached. 21 years ago I was sitting on my bed reading a book. Suddenly, I felt into a deep meditation-never meditated before. In this meditation I was a boy of 12 years walking on grass between hills on a sunny day.As i saw the entrance of a cave. I went near, but was afraid to go the steps down. Then, I felt a soft hand guiding me into the cave. The cave was about 35m x 12m. At the back of the cave, an old man wearing white clothes was sitting on a stage, radiating a wonderful bright light. He was smiling and gave me such a familiar feeling, I never want to forget. I lost my identity, didn't know my name and age. There was no time, no history.He raised his right hand, was deeply laughing, so confident and familiar.I rushed towards him, standing in front of him, and he touched my forehead with all of his love. The following days, everytime I closed my eyes I saw him looking at me.I started to search him within Frankfurt. After work, late at night, I went out to look for him. During winter time - it was cold, wet and dark. But I couldn't find him and I didn't know who he was until someone told me about him. After such a long time,Shirdi Sai is always present. Shirdi Sai Baba is educating me in every second. I just have to open my heart. He is sitting there and laughing. Dedicated to Shirdi Sai Baba we are singing Bajans, Hanuman Chalisa,performing Abhishekam to our Shirdi Sai Baba Moorti, We meet on Thursday and Saturday at 7 p.m.Pray and than eat our organic food. Please ring the big bell direct in front of the house. We like to stay with Shirdi Sai and want him happy.We like to serve him. Everyone is invited to visit and see Shirdi Baba in our temple. If you click the Photos on left side in our website , you can see more details of the statue, the temple and lovely garden and the nice people. The temple is in our house,not far from Goetheturm, near the forest in the city of Frankfurt. We decide important issues together when we meet . Last year we stayed in Jaipur with the artists.We have tried to make the moorti with the original photos of Shirdi Baba. Shirdi Baba wants the temple here and has helped us a lot. I am an ardent devotee of Shiridi Sai Baba. If you ask me since when? in fact, I do not remember. However, I am sure, Baba always answers my prayers. I am so thankful to you for sending this mail and, glad to know that, Baba is pulling everyone towards him, wherever you are. I am sincerely, praying to our God Baba to bless everyone on this earth. Please, do up date me. om sai ram very touching your mind&heart both are now the home of the almighty, the enternal energy dominent in this univers appears to have to pass by you feel it,it is extending to allthose who are searching for it& you are the guiding source through the LORD SAI.MAY SATHGURU SAI NATH GUIDE YOU TO CARRY ON THIS MISSION. Sai Ram. I am very happy to know that Frankfurt is having a Sai temple now. I passed through Frankfurt way back in 1985 on the way to Dusseldorf, Krefeld and then back from Dusseldorf to ALzenau near Hanau. The post regarding Sai Temple in Germany shows the omnipresence of Sai Baba. It also shows that Baba's love to his devotees know no geographical boundaries. His love is not even bound by any nationality. But, all the appreciation is due to you, who bringing all these rare treasure to the knowledge of Sai devotees across the globe. Your blog tells the extent of Sai brotherhood across the globe. May Sai Nath give you more and more strength to continue this marvelous work. 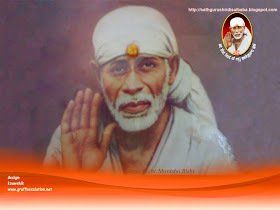 it is very good to know that sai's temple is there in fankfort.I every thursday to sai temple near by our place. he is always with us giving guidence. You Dont know Lord SaiNath has personally blessed you to open a Temple in Frankfurt....May be next time i visit Frankfurt i can come and visit him ..if he wants so..You have done a tremendous service for people of Frankfurt...who want to go to Shirdi Saibaba's Darshan in Frankfurt!! !......OM SAI RAM.. I have been searching Shri Sai Baba Temple nearby Frankfurt since long. I only got to know last month about it. Since then I have visited this temple every Thursday. I must say I experienced the same feeling I had whenever I visit Shirdi. I pray Shirdi Sai Baba to bless with Strength and Courage to Shri Sai Bandu Mr. Hari and Mr. Markus to continue this noble service. Thank you all for sharing your thoughts and kind word of appreciation .All merciful Baba has blessed this website and He is the complete Doer. Thanks for your encouragement and kind word of appreciation . Sai's blessing be on all . 2) What is the visitng time to the temple. Thanks in advance and eageryl looking foward to visit the temple. I am not very sure about the temple timings but I can provide you with e-mail and you can get in touch with the concerned person and discuss all the details you need. Please wait for my mail in your personal mail ID. mehr Informationen über Shirdi Sai Baba Tempel Frankfurt mit Öffnungszeiten,Karte mit öffentlichen Verkehrsmitteln und Festtagen. i find one thing is not good on the sai baba mandir in frankfurt germany that we afghan hindus are nt aloud to go inside the mandir ! Hi, I m very happy that there is temple of Sai Baba at Frankfurt. I just want to know how to create a temple . I m leaving in France, and want to have a temple of Shirdi Sai Baba. We visited Sai mandir for the first time today and felt immensely blessed. Jai Sai Nath. The moorty of the sai baba at Frankfurt, is whole world in itself, especially an eyes of baba speak with you and go deep into your heart. In this temple at the courtyard of baba, no one is small or big, first or last everyone they treat equally. More than a background of a person, a person is valued with love and care. People doing seva are more than a family , open hearted without any discrimination. I am very much benefited by being part of this temple and very happy to have a temple like this in Frankfurt. When i use to stay in Frankfurt for my studies, i make sure i visit Frankfurt Sai Baba temple on every Thursday. Every visit is an experience and i personally had inner talking's between me and Baba. Lot of my prayers had been answered and overall experience with the other devotees in the temple reminds me of home. I also liked their concept of serving prasads in their wonderfull garden space, feels closely connected with nature. I certainly want to visit when i make my next trip to Frankfurt. It gives us immense pleasure and happiness to share our experiences with Shirdi Sai Baba Temple, Frankfurt. To introduce ourselves, I am an IT Consultant and my wife is a Biotechnologist, and we have been living in Germany since 10 years. We happened to visit the Shirdi Sai Temple for the first time in May 2009, with a lot of curiosity to experience a Temple started by a Doctor who is a German, by birth. The moment we entered the Temple premises, we were heartily welcomed by Hari, wearing very old clothes, sitting on a bench in the garden, peeling vegetables for preparation of the Prasadam for the Thursday. This first site itself spoke for what this Temple represented i.e. Simplicity and true essence of SHIRDI SAI BABA. The Site of BABA’s statue and knowing the first experience of Hari with BABA, made our faith and connection even stronger that day. Since then we have been regular to this holy place for Satsang on Thursdays & festivals and for SEVA on Saturdays. Hari welcomes every devotee with a big heart and guides them to understand, follow and serve BABA in the true sense. We could meet devotees from different nationalities and various backgrounds and learn how BABA have blessed one and all without any differences. The Temple regularly helps the needy with free accomodation and food. The temple is open on Thursdays for Satsang and on Saturdays for SEVA for all. However, it is open on all days for regular devotees. As per BABA’s guidance, the temple is kept close to the Nature and the devotees: The Wood required for the dhooni is cut and collected from the nearby forest. The vegetables that are required for the prasadam, and the flowers required for the pooja are grown in the Temple’s Garden. This is done as part of the SEVA by the devotees on Saturdays. The expenses incurred for running the Temple are equally shared only by all the regular devotees, without any donations. This temple tries to serve BABA in true sense and we are very blessed to be part of it. Thank you BABA and Hari. I visited Shirdi Sai Baba temple in Frankfurt in the New years eve of 2012 and I visited the temple with my friends. My first experience was very nice. The temple has lot of positive energy and is in full of peace. After visiting the temple, Hari has always guided me and everyone in the temple towards right path of life which baba advocates. The temple is a big symbol of Love and peace and always guided me to take the right path in life without ego. Forgeting myself in everyday activities and being attracted towards material happiness,carrying this ignorance when I visit the temple, Hari and baba constantly taught me of to the universal truth (Advaith= Everything is one). The temple gives me peace and energy. I like to visit the temple often. The temple taught me lot of Holy Bhajans like Hanuman chalisa which I never even learnt back in India. Baba is very much alive in the temple. During my first visit I sat almost on the last row and was silently on tears and requested him to solve one of deepest personal problems. After the first visit, in no time he solved the problem that I requested for so quickly. Unable to accept my zero progress with my PhD work, I always asked Baba for help with tears when I visited the temple next time, He helped me gradually to overcome all the problems.. During my restless depressing times when I visited the temple, Baba has shown me grace by making me happy and provided me a lot of mental strength and he has solved several of my research experimental. difficulties, With his only grace, I could progress from nothing to something in my PhD work. Whenever I missed to visit the temple, baba murthi(statue) has appeared in my dream several times. I feel totally protected by Baba every now and then. miracles by saving me from biggest of biggest difficulties has increased my confidence and faith in Baba. When I broke my leg, He blessed me up with such a fast recovery and with loving parents helping me out. The best place for me in germany is to visit Shirdi Sai Baba temple at Frankfurt. My purpose to live in germany away from home is fulfilled by visiting the temple and being guided deeply towards the path of love and oneness by baba through hari. Beautiful experience.. Ambadnya for sharing it with all of us :) May Baba shower His blessings on all us.. Such a lovely and lively temple of Shirdi Sai Baba Temple in Frankfurt. It is indeed Baba's grace that this is the first Shirdi Sai Baba temple in Germany. Both me and my wife are devotees of Baba and Baba is always caring for us like his children. I would like to share my experience of my lovely Baba here. Ever since i got to know about Baba in India, Baba arranged that i could visit him in Shirdi and a strong intense bonding developed. In 2010, I decided to study in Germany and i always wanted Baba to be there wherever i go. It was Baba's grace that i got an offer to study in Frankfurt. I was so much in joy to realise that here was the only Shirdi Sai Baba temple in Germany and Baba helped me to make the right choice. In October 2010, I visited the Baba temple in Frankfurt and was full of tears since I could feel Baba’s presence there. Looking at his face and blue eyes makes you forget all the worries and desires and I used to see him for long with tears of joy in my eyes. I was very grateful since Baba made everything happen in the right moment. I loved the Satsang, we sang the sacred Gayatri mantra, Sai Bhajans and honour all Gods, I felt the energy levels increased and immersed in the prayers with devotion around. I felt Baba’s presence here and he is sitting in front of me in this room and always guiding. Baba’s murti is so lively that one can feel the different expressions here. Sometimes Baba used to be happy, smiling, cheerful mood, other times he was angry and serious and silent. Baba cares for all his devotees. By Baba’s grace, I visited the temple every Thursday and Saturday during my studies in Frankfurt. A year later when my wife joined me in Frankfurt, she was surprised and happy to see Baba full of life and love in the temple. Due to my work assignment I had to move to Dusseldorf but Baba grace makes it possible for us to visit him often. 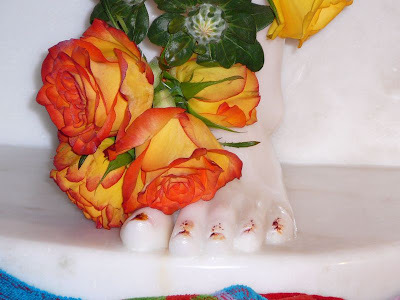 Every Sai devotee coming to the temple served Sai Baba in their own ways. We performed seva on Saturday by collecting & cutting wood logs for the Dhuni , planting salad leaves, vegetables, watering the temple garden, plucking the fruits. I loved the way everyone was serving Sai Baba sincerely. Baba is always happy when we are serving him. Hari always used to say that we should perform selfless service just like Lord Hanuman rendered selfless service to Sri Ram forgetting that Hanuman himself was mighty and God. We sang Hanuman Chalisa very often for long time in the temple. So much Love. Only by Baba’s grace one can go to visit him here, When I met Hari for the first time, I had wondered how Baba plays his part to make things happen. How Baba made Hari know about him and how Hari setup the temple in Frankfurt which has helped so many Sai devotees to find the truth and serve Sai Baba. Hari guided us and explained Baba’s teachings in many ways the deepest truth and inner truth that is hard to find in any books or internet. Most importantly he guided us towards the oneness of universal Consciousness and simplicity of life. Hari and all the people who visit here in the temple are like family. We sing, meditate , pray, cook and eat and offer service together. I and my wife feel blessed to be part of the temple and to visit here often. I was full of joy and I had never experience this in any temple anywhere in India. One cannot gain the knowledge what I gained here with Baba and Hari in this temple. The Shirdi Sai Baba temple in Frankfurt was a special place where I learnt the deepest meaning and experience that I cannot express. You can only experience it for yourself. What you feel here in the Shirdi Sai Baba temple cannot be expressed by words. You are only silent when you feel Baba’s presence and he is caring and loving you always. I am thankful to My Sai for all his grace and Hari for all the things that he has offered in the temple and made us realise the truth which I could not find elsewhere. Om Sai Ram, Peace be to All. I heard about Sai Baba from my childhood. But I knew very little about him, although I visited Shirdi twice. In 2008, I came to Frankfurt on my company assignment. 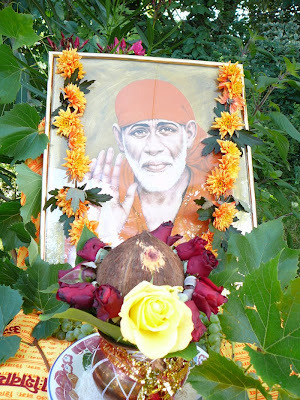 I heard about Shirdi Sai Baba temple in Frankfurt, but never went. When my assignment was over and I was about to go back to India, suddenly I felt as if I was missing a very big thing. And with repentance of not visiting the temple I went back. To my surprise two months later again I got a chance to come to Frankfurt. Then I visited the temple. It was June 2009, I still remember that day and the feeling inside me, a joyous silence in emptiness. It is indescribable. Thereafter I started going there regularly. It was a turning point in my life. Here I learn about many other saints and their teachings. Later my wife joined me and we continued our service. Sometimes I really wonder about the connection. Baba has been guiding us to experience the power of surrender. An ocean which accepts anything, love, bitterness, happiness , sorrows, care, ignorance. An energy which shows the path of realization. The temple has been a place to realize and feel the beauty of such an energy. Thanks to Baba, the temple, the devotees, for everything. Sai Baba Temple in Frankfurt has changed my life, my thinking, my way. Always we feel protected by a supreme power. It’s hard to describe each and every experience of my life. It is endless. As if everyday, he is there to guide me, observe me, care me. I started developing the moral fear to my dearest Baba who scolded me and in return guiding me in each and every steps of life whenever I thought or felt or did something wrong. . The greatest teaching I learned is to accept whatever is coming on the way rather to be demanding how things should be according to me. I would not say that I learned complete surrender, rather I would say He has been teaching me how to move towards complete surrender. 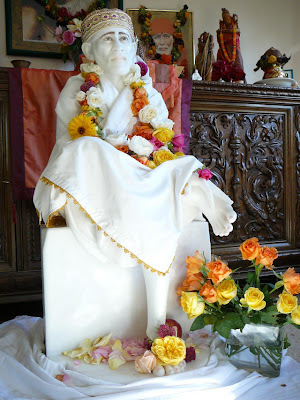 Shirdi Sai Baba Temple in Frankfurt, for us, is the greatest and easiest way to find Baba. Here, apart from regular pooja, we always try to serve the inner Baba in form of soul who is sitting in everybody’s heart and giving more emphasis on service. I want to thank Baba, all devotees of Saibaba’s Temple Frankfurt and especially Hari for his endless care, guidance and support. Photos we like to share . If what you see by the eye doesn't please you, then close your eyes, be silent and see from the heart.Heart can see beauty and love more than the eyes can ever wonder. Wenn das, was Du gerade siehst, Dir nicht gefällt, schließe die Augen, sei still und schau vom Herzen.Das Herz sieht leichter Schönes und liebt, was Augen nicht erkennen können. Can we visit anytime on saturdays? Baba bat Hemadpant selbst, es zu veröffffentlichen.Es heisst Sai Satcharitra und ist jetzt kostenfrei im internet bis Kapittel 36 in sehr gutem deutsch zu lesen.Die Sprache ist lebendig, tief und wahrheitsgemäss.